Today was Amazon Prime Day. among other things, they have lightning sales. Our OCA 8 book was one of them. Up to 100 people could buy a discounted copy of the book. Six people did when I checked shortly before the sale ended. I’m impressed that anyone knew about it. That or 6 people normally buy the book in the 6 hour timespan of the sale and this was random luck. This screenshot shows our first Amazon Prime Day lightning sale. Very cool. I read online that some Amazon sales are illusions. So I checked on Camel Camel Camel. In the last three months, the price was never lower than $29 and averaged over $30. So twenty five and change is in fact a sale. Happy Prime Day. Announcing: Our NEW Java OCA / OCP 8 Practice Test Book! Jeanne and I are thrilled and excited to announce that we are nearly done writing a brand new book for the OCA / OCP Java 8 Programmer exams! 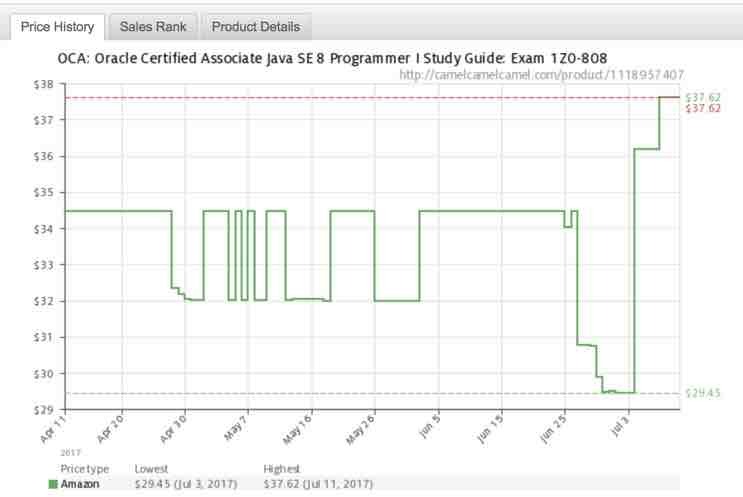 The new book, OCA / OCP Java SE 8 Programmer Practice Tests, includes over 1000+ hand-crafted and peer reviewed questions. We’ve also created a new permanent Practice Tests OCA / OCP 8 book page on the blog to keep track of updates and news about the new book. Jeanne and I wanted to say how thankful we are to our all of our readers of our first two books. Without your invaluable feedback and positive reviews, we never would have been offered this opportunity to expand our OCA and OCP subject matter. We promise to make this next book our best yet! We are expecting to ship the book in March 2017. Stay tuned for additional news about the book!